Show your love for the Merc with a Mouth with this Deadpool Bi-Fold Wallet with Metal Logo! This awesome wallet features Deadpool on the exterior and his iconic logo cast in metal on the bottom right corner. It is fully designed with 4 vertical card slots, a clear ID window, a cash pocket, and 2 hidden slots. Leathery and sleek, this bi-fold wallet is just as smooth as Wade's costume! 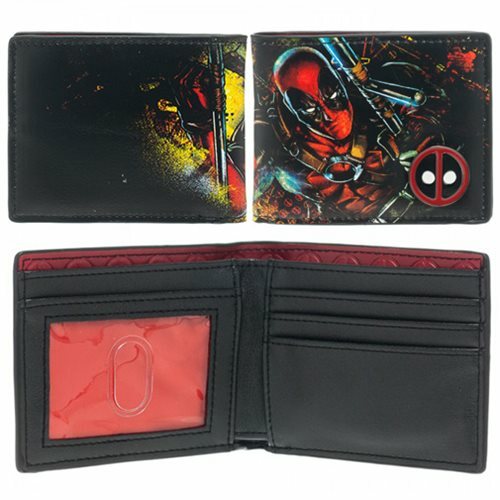 This Deadpool Bi-Fold Wallet with Metal Logo measures about 4 1/2-inches long x 3 1/2-inches tall closed. The chain measures 15-inches long and the wallet is made from synthetic leather. Ages 14 and up.